Each New Year Udemy offers a discount on their classes. This year I signed up for about 5 classes. One of the classes is Introduction to Modern Programming with PHP. I decided to freshen up my skills and expand my knowledge a bit in the web development arena. I love working with web applications, but I have never formally studied it. Most of the time I have gained knowledge under the pressure of fixing something that is broke or because there was no one else available to work on it. This year I decided to take control and learn at my own pace and enjoy what I am learning. Two years ago I started playing around with Twitter Bootstrap and never went anywhere with it. Last night and today I learned more about Twitter Bootstrap than I ever did fooling around on my own. In the course I also learned about a wonderful Text editor named Atom. I have been using Notepad and Adobe CS6 Dreamweaver to write code in and now I will always use Atom. 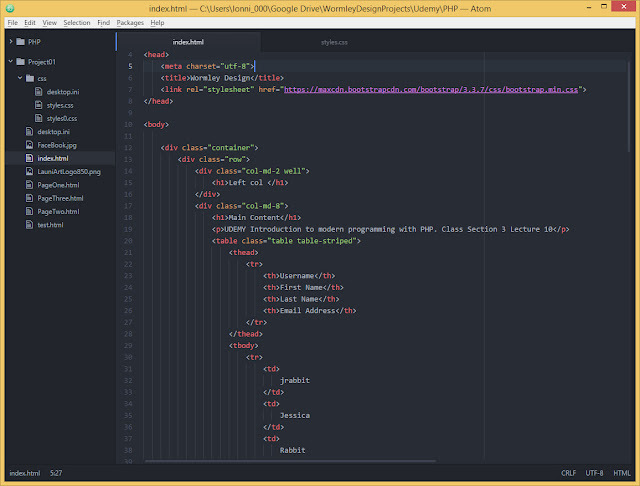 Here is a screen shot of Atom and my code for my Boot Strap page. 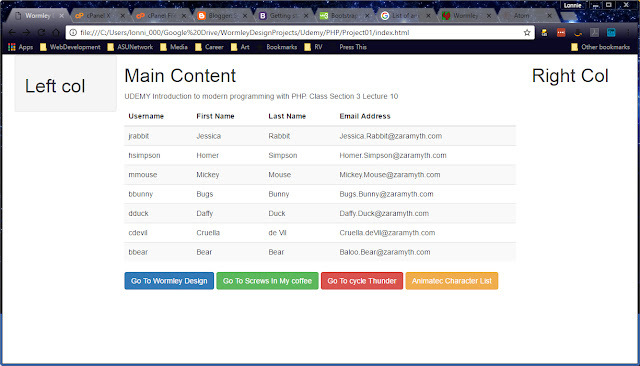 I have a live link to my UDEMY Introduction to modern programming with PHP. Class Section 3 Lecture 10 here. My Bootstrap page with a table of cartoon characters. I like building stuff, virtually as well as physically. I cannot wait to build some stuff using my newly created MariaDB cluster. For this class we are using the PostgreSQL database. I guess I will have to build a PostgreSQL cluster next.